In February 2016, the IwB hosted its annual International Charrette. The theme of the charrette, “Balancing Continuity & Change”, was draw from the students’ work on the Interstitial Zones project. Interstitial Zones is a major IwB initiative and partnership with the Kerry County Council, and other local stakeholders, in southwestern Ireland. The project focuses on creating sustainable economic development that will provide new job creation in the region. The Balancing Continuity & Change Charrette built on the IwB’s work on this project, particularly the results of the Imagining Iveragh Charrette, which the IwB students conducted in Ireland in November 2015. Charrette teams were asked to identify ways to leverage Iveragh’s existing assets, and imagine new possibilities for job creation that consider the current and future needs of the local community and region. The goal of the Balancing Continuity and Change Charrette was to design proposals that can create sustainable economic growth by generating jobs and stabilizing the economy in the Iveragh Peninsula. To create this growth, charrette participants were asked to use three strategies to guide the design of their projects: collaboration and visibility, learning through discovery, and accessing remote places. The people of the Iveragh Peninsula are deeply rooted in their culture and heritage. They enjoy living a simple life and it is evident that they do not want exponential growth or drastic change. The goal for charrette participants was to introduce change to the region in a minimal and effective way to make a positive impact, while keeping what the people of Iveragh hold valuable the same. Eleven teams produced 11 different design proposals, ranging from a marine centre called the Mara Centre, to a pop-up health service called ioMED. The charrette teams’ proposals are summarized below. To find out more, view the Balancing Continuity and Change Charrette Report. The challenge: To create a social platform and infrastructure in Iveragh for people who want to start their own business and want to develop technical and business skills for success. Concept: “Weave” is a co-working space that targets people looking for a space to start their business, and also for people who are looking to expand their existing business or skills. Through beautiful and culturally relevant co-working spaces, Weave revitalizes local economies, enhances people’s experience and drives connections through education, innovation, and enterprise development. The challenge: To take an already existing Transition Year program, which is considered a local asset, and to connect students to the region and the Kerry community, while developing necessary skills and encouraging leadership. Concept: “The Muínin Project” creates a framework for an updated Transition Year program, where students build ‘muínin’ (confidence) in Iveragh by discovering, exploring, creating, innovating and collaborating in the region. The challenge: To create a journey using archaeology sites where people learn about the history and culture of the region while having a deep and meaningful experience. Concept: To create an experience of self-discovery for visitors by activating the Ring of Kerry as the “Ring of Stories”. The Ring of Stories allows visitors to have immersive experiences while reflecting on their own life. Ring of Stories is a series of walks for visitors to see archaeological sites and a centre where they can learn more about archaeology and their own Irish roots. Ring of Stories will partner will locals to create a program that will host visitors to the Ring of Stories. The challenge: To design an attraction for the Iveragh Peninsula that focuses on the marine wildlife and microclimates of the region through interactive experiences and innovative research. Concept: Uniting the beautiful landscape with the diverse marine ecosystem to promote awareness, education, conservation, and community, that will fuse the land and the sea, enveloping the marine ecosystem, and dedicate a new facility to its sublime views to showcase local marine life. The challenge: Utilizing Iveragh’s existing scientific resources to bring professionals and the public together, in order to develop a climate-oriented program. Concept: “The I.E. Centre” is a creative climate centre that offers innovative education and interactive experiences. It aims to centralize the existing strength of climate study in Cahersiveen and to maximize the attraction of climate professionals, such as environmental experts and earth science students, as well as the public who are interested in climate change. The centre is a carrier of many innovative co-study programs which bring professionals and the public together to contribute to a better future. The challenge: To create a distinct architectural landmark and year-round programming for an ecology centre located in the Iveragh Peninsula that promotes research and education on sustainability and conservation of existing ecosystems. Concept: “Kerry Eco” is an initiative that will transform individual and collective perspectives on interdependancy between nature, people and technology. It will educate people about the seriousness of environmental issues, research and the importance of support of existing ecosystems in Iveragh. Kerry Eco promotes biodiversity and sustainable living, and surveys renewable sources of energy in the region to determine how they could be utilized or preserved. 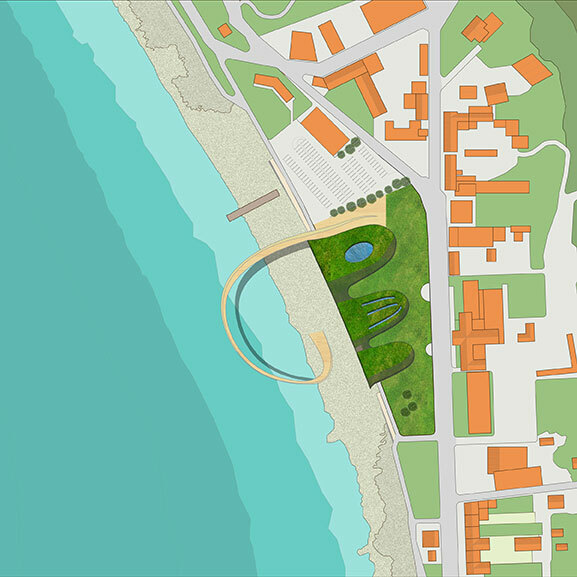 Kerry Eco includes a visitor centre, an ‘Ecolution lab’, energy generating gym, an Eco Pier,a viewing station that will connect the land and sea, and a tidal power station. The built form was designed to fit into the landscape and not obstruct the natural beauty of the area. The challenge: To re-imagine how and what kind of food is produced in Iveragh. Concept: “Fomhar” (growth) is an innovative food production system that creates value from the existing assets in the region and creates new agricultural industries. Fomhar re-imagines how food is produced in Iveragh by establishing a hub for research and development of the regional food assets, in order to create new industries. It will bring together farmers, scientists, chefs, and students in effort to develop new ways of growing and utilizing the agriculture in the region. Proposed site area: The Dark Sky Reserve; St. Finians Bay Caherdaniel. The challenge: To design a landmark centre that celebrates the Iveragh Peninsula’s Dark Sky Reserve while leveraging research, education and tourism opportunities for residents and visitors alike. Concept: “The Edge” celebrates the transcendent nature of the Iveragh Peninsula’s sky. The Edge is designed to be the place for reorienting our inner self to the universe. This centre will focus on catering to three main aspects: Interaction, Research and Accommodation. The main centre and accommodation pods will be constructed in the layout of Orion. The research centre aims to introduce new technologies that will help with education and new ways of learning about astronomy. The programs will encourage learning through exploration and include a moonwalk room, astronomy conferences and an augmented reality space station simulation. The Edge will also have an event space where events such as night weddings and conferences can be held. The challenge: To design a product, service and system that provides the residents of the Iveragh Peninsula with accessible healthcare and basic health education opportunities. 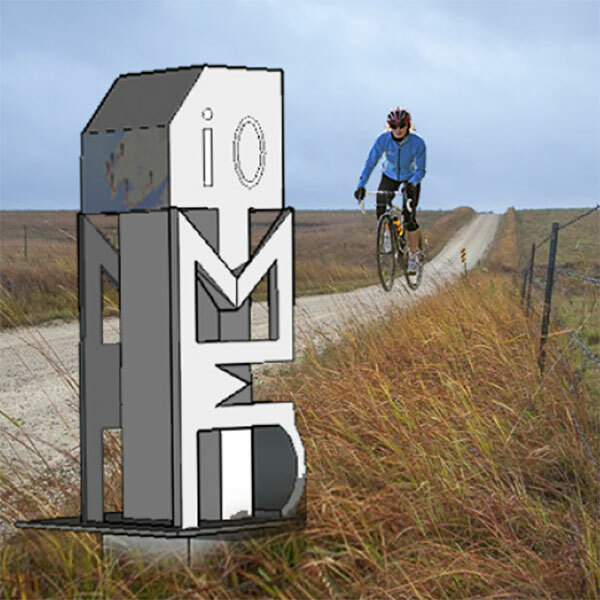 Concept: “ioMED” is a pop-up community health service that provides medical, social and emergency care to the locals and tourists of the Iveragh Peninsula. ioMED will be a fleet of medical cars and buses that will provide a series of different health and social services that look to build and empower the community as well as address the safety concerns of tourists. The challenge: To get residents and businesses to collaborate and adopt a forward thinking and cohesive system for the numerous trails and paths in the region. Concept: “Skelling Kerry Ways” is a cohesive brand for Kerry’s trails and paths that establishes a Heritage Centre Complex as a central access point for the Skellig Kerry coastline. Skellig Kerry Ways proposes to use Iveragh’s existing assets to help spark more economical development in the region, by linking the existing trails and ways and branding them under a unified name. The concept includes physical features such as: a new amphitheatre, a mural installation, pop-up marketplace and improvements to the existing Iron Bridge. The challenge: Utilize the existing infrastructure and create a transportation system which will connect the residents of Iveragh with each other and alleviate social isolation. Concept: “Iveragh Conenct” aims to elevate social isolation in the region through transportation. 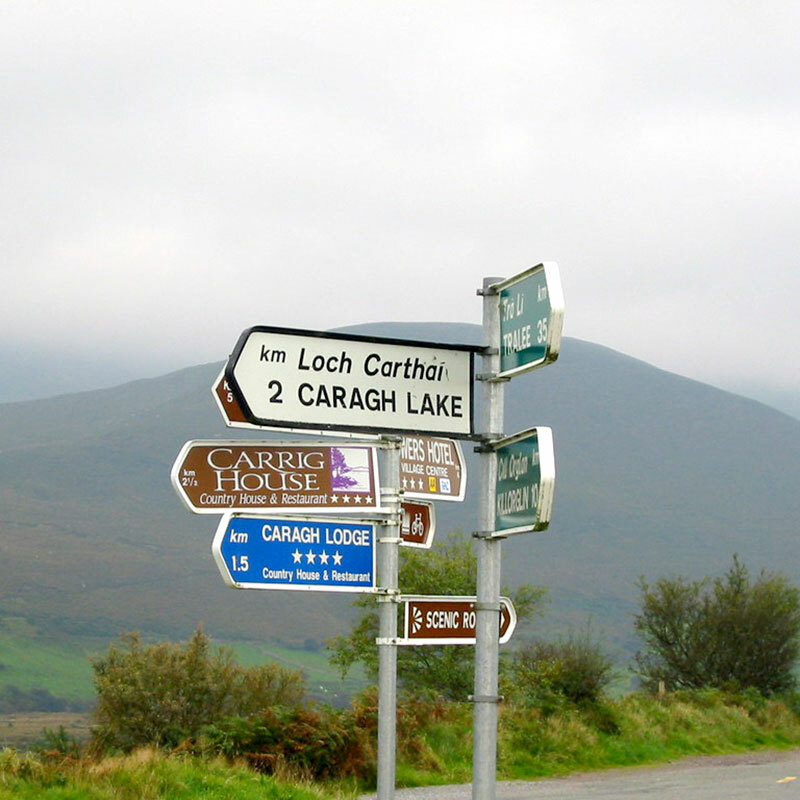 Iveragh Connect allows people in the region, to not only travel from one town to the other, but also to enjoy the landscape while travelling. The service caters to people living in the region and the tourists visiting the region. The key to this system is not what the service will provide with its tools but how these tools make it easier for people to use the services. The system consists of 3 main modes of transportation, which are buses, e-bikes and pick-up & drop-off service. These services run all year long and will give an opportunity to residents to work for Iveragh Connect.